EDOUARD LEON CORTES (1882-1969) Edouard Leon Cortes, of French and Spanish ancestry, was born in 1882. As an adolescent, he became fascinated with the arts and at seventeen began his studies at the Ecole des Beaux-Arts in Paris. In 1901 he contributed a dramatic Parisian street scene at dusk to the Salon des Artistes Francais, which brought him immediate fame. Later, as an active member of the prestigious Societe des Artistes Francais, Cortes exhibited his works yearly at the Societe Nationale and the Salon des Independants in Paris. On the topic of Cortes and his relationship to Paris, biographer David Klein writes: "Paris changed during the years that Cortes painted it, and the changes appear in his paintings. Horses and carriages disappear in favor of cars and trams; women's hourglass silhouettes and picture hats give way to boyish figures in short skirts and little furs, gas streetlights turn into neon signs and glaring headlights. But despite two world wars and the introduction of the machine age, the Paris of Cortes remains primarily the city of the Belle Epoque. His paintings are often filled with nostalgia for the period." The period we know today as La Belle Epoque lasted from about 1880 to 1914. Many revolutionary ideas in politics, technology, science, poetry, music, literature and the fine arts emerged in Paris during this vibrant time. Paris was the cosmopolitan, fashionable stage on which the drama of the Belle Epoque was enacted. The city itself was in a state of dramatic change. The campaign of rebuilding undertaken by Napoleon III and Baron Haussmann in the 1850's, 60's, 70's yielded wide tree-lined avenues, extensive parks, and elegant golden-gray stone buildings. Parisians thronged the new boulevards, parks and theatres to see and to be seen. In 1888 the Figaro Illustre devoted a special issue to this "spectacle de la rue", calling the boulevards "the true theatre of Paris". His paintings express the romance, energy and charm of old Paris through his masterly application of bold brush strokes and intriguing colors. His works display the profound knowledge he held of perspective and composition; and, the viewer's eye is most often caught by fascinating details - the play of lights on wet pavement, shadows on streets and glowing windows and street lamps. On any one of Cortes' canvases, one can find an array of tones ranging from soft gray hues and ambers to vivid reds, yellows and oranges. A splash of purple may be a man's tailored dinner jacket or a stroke of blue, a woman's cloak. The viewer cannot help but marvel at the overall effect of the artist's composition. After a life long dedication to seizing the magic of Paris during its transition from the romantic Belle Epoque to the modern, twentieth century metropolis as we know it, Cortes has left the world a legacy of master paintings. Now found in the most prestigious collections throughout the world, his work continues to awe collectors." 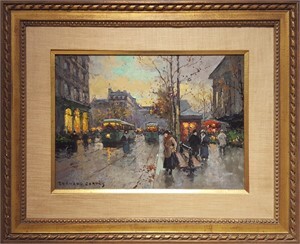 Excerpts from Edouard Cortes, reprinted with the kind permission of Mr. David Klein.